Bruce Robison earned a PhD from Stanford University and was a Postdoctoral Fellow at the Woods Hole Oceanographic Institution. He then returned home to California, and to UC Santa Barbara. In 1987 he joined the fledgling Monterey Bay Aquarium Research Institute (MBARI), where he is currently a Senior Scientist. Robison’s research is focused on the biology and ecology of the animals that inhabit the ocean’s deep water column. He pioneered the use of undersea vehicles for these studies and he led the first team of scientists trained as research submersible pilots. At MBARI, he has focused on the development of ROVs as platforms for deep-sea research. Robison is a Fellow of the American Association for the Advancement of Science, and a Fellow of the California Academy of Sciences. 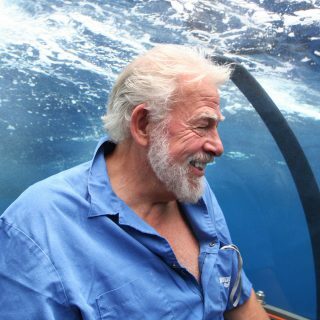 He has received the Marine Technology Society’s Lockheed-Martin Award for Ocean Science and Engineering, and the Ed Ricketts Memorial Award for Lifetime Achievement in Marine Science. In 2007 he was a Resident Scholar at the Rockefeller Foundation’s Bellagio Center, in Italy. He is also a Research Associate at the Smithsonian Institution. Robison is the author of more than a hundred scientific papers on a wide range of organisms from fishes, squids and jellies, to krill, dolphins and algae. Aboard Falkor he will lead the scientific operations of ROV Subastian, exploring and surveying the water column at the Café to learn why white sharks congregate there.